Recently I have been going back to doing most work through Audiobus to Auria. The below experimental process has more or less become a bit too tedious. As I described below, I was working what really has begun to feel like a double process. Read down for details. Now I am skipping the multi step process and simply running my audio through Audiobus to Auria where I arrange, mix, automate and master. So much faster. I’ll still use Cubasis for sketching and where certain apps don’t work with Auria through Audiobus. 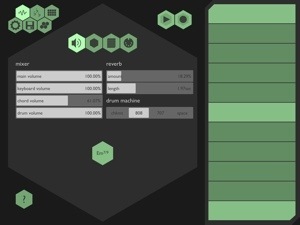 Apps like Addictive Synth, and Grain Science. In those cases it’s not much extra work to give them a run through to Cubasis first, then once recorded in Cubasis I’ll put that in an Audiobus input, and send those recordings to Auria. Really any number of adjustments and options are available to work around any road blocks. iOSMusician.com has invited me to do an interview focused on my process. Good timing as I’m settling into a more streamlined flow, and I find it much easier to explain it when asked direct and specific questions. Otherwise I just ramble trying to cover everything. No matter what comes of any of this, the only good process is the one you discover. Possibly taking a few cues from others, but a carbon copy is never universally accepted. Part of the beauty of iOS music is the numerous variations of options that can lead to as many work flows. Nobody has “the” workflow for everyone. If I don’t detail enough of what I do, then just ask me. Pretty simple. Send me an email: SmiteMatter@comcast.net I sincerely do not mind. I get plenty as is, but never feel bothered by receiving more. Plus I’ve used or tried pretty much every single music app around, minus the novelty apps. As for iDAW types, I started with NanoStudio, then Studio HD, and the rest now and then like MultiTrack DAW, BeatMaker 1&2, Music Studio, FL Studio, Meteor, and others I’ve probably forgotten about. So I might have an answer, but I don’t know everything. I thought I’d share some of my process, since it is something I am asked frequently to do. Much of how I’ve made my music with iOS over the last 4 years-ish, has been in a constant state of change. Thanks to Audiobus, much of the labor has been eased. I still appreciate the uses of AudioCopy/Paste, but I haven’t used it much at all since Audiobus came out. My main iDAW is Auria. It is the only iDAW currently available with solid high end, FX, and mastering tools. Tools that are absolutely essential in what I do. Far from perfect, Auria has the very best capabilities for creating a well polished mix. The GUI though is a bit unforgiving if not sometimes a flat out pain. I’m sure that will be improved over time. In addition to its superior FX, Plug Ins, EQ, etc, the full automation capability is also very important to me. Now that I have Cubasis ( an accidental download while juggling my coffee, cigarette, iPad, and some other app downloads ) I’m finding ways to make the best of the two combined. Cubasis has an outstanding GUI. Its very smooth, and reliable. 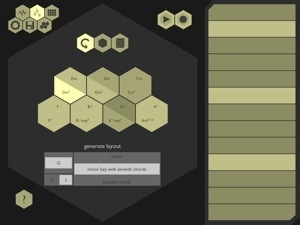 Virtual Midi is becoming more important to me thanks to Cubasis. 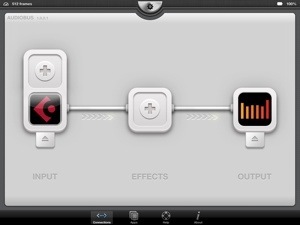 Its Audiobus integration is one of the very best Ive seen so far working on iPads 3 & 4. Mixing, arranging, editing, and all that is a great pleasure. Like Auria, Cubasis has its strengths and weaknesses. The EQ in Cubasis is a prank at best. The FX are low quality. No automation, and in my opinion grossly incapable of mastering at even a average level. But, that’s OK for now. However I wish I knew why developers can’t seem to put the best of both worlds into a single iDAW app? Whatever the reason, I can’t dwell on it, and have to make the best of what I have available to me today. How I use these two iDAWs with polar opposite and equally different strengths is something of an unusual workflow. Maybe, maybe not? Its certainly experimental. In short I begin work setting up Cubasis at the Audiobus Output spot. Then use my various synths, and other music apps at the Input. In order to preserve as much device power as possible and reduce chances of problems, I try to use only one or two inputs at any given time. 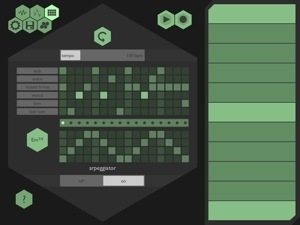 Sometimes a FX app occupies the Audiobus FX spot. Ill do all the initial recordings to Cubasis. Then edit, measure, and arrange. Avoiding FX, and keeping the tracks “dry” for the most part. They are useless to me and, I’m not going to need them anyway. Again, much of what follows is still being worked out and may change depending on what I discover or decide to alter. I’m experimenting. After I have my rough, dry mix all arranged and set how I like it, Cubasis reverses its Audiobus role. As seen in above screenshot. Now its in the Audiobus Input spot, and Auria is the Output. I could just mix down or send the entire project to a single Auria track. That probably would be quicker, but defeats the end goal of having fully separated, individually mastered tracks. So I haven’t even experimented with that. Can’t make sense of it. Instead I have chosen to go the painfully tedious route. I “solo” the Cubasis tracks one at a time and Audiobus them to Auria. One at a time they are recorded in Auria set at the same positions as they were in Cubasis. Kind of mirrored. This almost always ends up needing a bit of a manual tweaking to adjust and sync everything as well, in Auria. Eventually everything is in place in Auria. Then I disengage Audiobus completely, and shut down all other previously running apps, except Auria. Out of Habit I might fully shut down and restart my device also. Either way it works out. Now with only Auria running, I am free to start adding FX, and plug ins to each necessary track. Ill also work on various automations, freeze tracks at any opportunity, and put my polish on the overall mix completing the mastering needs. That’s pretty much all there is to it. Something of consideration is project size. Since I’ve solo’d tracks into Auria from a full mix I expect rather large project files. So far its not been too big a deal. It remains to be seen if that’s going to be a problem. I’m still experimenting with all this. So far so good. I’m getting the best of both worlds, and the results are promising. I do not expect or even recommend my experimental process to catch on. Not at all. It may sound insane to some people, and overly complicated? Maybe it is? It works for me. I’m maximizing the strengths of two amazing apps and happy with the results. What I get out of it, is not presumed to be universal. In the end, its better for me than the old days of having to copy and paste parts. There’s always going to be some guess work and a search for work arounds. At least until someone develops a single iDAW that does everything right, or one of these two progress into that single iDAW of my dreams. For now that’s my new, and experimental process in a nut shell. Or from a nut out of his shell. PS Coming up: A full Cubasis review. Then a review team up I call: “Remarkable Or Regret”. PantsOfDeath (known to most) and I, are going to put a review together and share with you. It should be fun. We have completely different workflows, needs, wants, etc. Maybe even polar opposite? Plus we have very different music styles. A couple things we do agree on is our passion for iOS, and love of creating music. 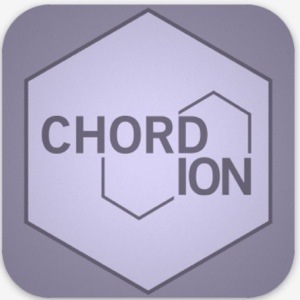 We hope this coming review will be helpful in showing two different perspectives in a fair manner reaching a wide variety of iOS music makers. What will we be reviewing? You’ll see. I’ve been making music using only iOS devices and music “apps” going on 4 years now. In that time I’ve seen, used, beta tested, and reviewed countless music apps. I own somewhere around 400 music apps alone. Not counting all the crazy games and gadget apps. Addiction anyone? In all that time development has gone berserk bringing new, improved and capable apps. It’s been nothing short of astonishing with how far it’s all come. Not to mention the insane low prices. Oh the prices! So low, for such brilliance. In the early days using iOS music apps had been a bit cumbersome. I sure thought so. I had to record in one, audio copy and then paste into another. That was never enjoyable, but it made a lot of things possible that otherwise couldn’t be done without hooking up to other hardware or computers. I hate wires, iTunes File Share is dreadful, so record & audio copy were essential features in any music app I would take seriously. Nothing against apps that didn’t have audio copy, it was just what I needed to do what I wanted to do wire free. Audiobus finally arrived in December 2012 forever changing how I make my music, as I am sure it has done the same for many of you. It essentially brought everything together in a seamless and simple process. Not unlike how music is made on computers with DAWs and VSTs. 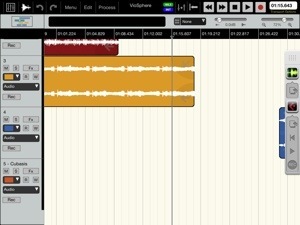 They day I got Audiobus was the last day I used ACP in my process. It wasn’t until January when more developers supported Audiobus in significant number. That number grows day by day. 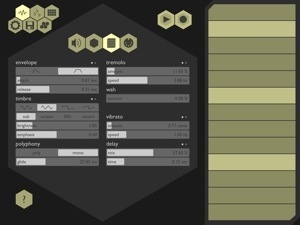 Today everything I use to make music goes through Audiobus one way or another. See ya ACP! After years of wishing, and hoping for something like Audiobus, and now having it, there’s no going back. So why do so many new music apps come out with no Audiobus support? Why? It is now the most necessary feature for any music app. It has resolved any need for any other method of transferring audio between music apps. Any other method is just painfully outdated. Obsolete even. Somehow new music apps keep coming out with no Audiobus support. It doesn’t make sense? Why release an app that makes us drool and get all excited about it, only to learn the apps developers failed to recognize that they left out support for one of the most critical features? 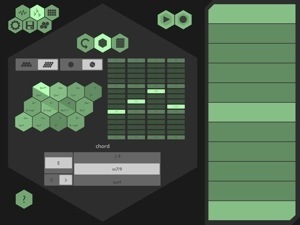 Hey look, a really cool new synth arrived in the App Store that sounds amazing! It’s a must have! Oh, wait a second? It doesn’t have Audiobus support. It doesn’t even record? What? You can only transfer audio via iTunes File Share or through some proxy via audio copy paste in another app. For the love of gawd why? OK, that was extreme. To me though, missing something like Audiobus support in the initial release of a new music app is pretty extreme itself. It reminds me of my favorite comparison of offering the coolest sports car ever made but with no steering wheel. They’ll be upgraded to support that later. Ferraris without steering, that’s what these new music apps without Audiobus are to me. Apps made before last December get a pass. So do Midi controllers for the most part. They are jumping on board and updating often in most cases anyway. It’s the newest music apps that are making my head spin by arriving without it. A year ago many of us would dismiss an app as a “toy” if it failed to have its own record function and audio copy. Today if a new app comes without Audiobus support, and no support even for the old ACP tech from past years, its hard to not feel teased. It’s a no brainier. 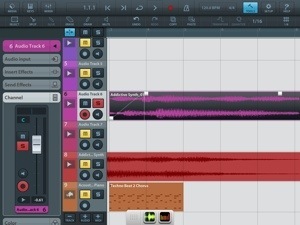 New music apps must have basic functions and supports. Unless the intention is for novelty use. Maybe I am alone on this? Maybe no one else wonders why a developer would create a super cool new music app that everyone will want, but not make it useable by today’s standards? It’s possible these are just the rantings of a mad man. Nevertheless, I am begging developers to please stop teasing me with the absence of Audiobus support, but are otherwise highly desirable and cool new music apps. No one wants to buy a Ferrari that only goes strait, and will be upgraded later if enough customers ask for a steering option. No more App Tease, please. You know Audiobus support is crucial. Just finish it, then release it. 4 years ago it was tolerable. Today it’s just silly. Can I get a second from any other end users in the comments? I’d like to hear from you if this strikes a chord. No pun intended.